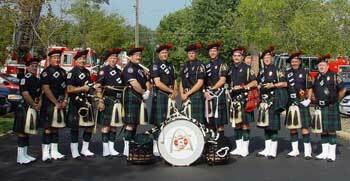 The Greater St. Louis Area Firefighters Highland Guard is a dedicated pipes and drums band comprised of local firefighters. We are available to honor our colleagues in times of joy and sorrow. We have pipers and drummers from across the St. Louis Area. We are always looking for financial assistance. Contributions to the Highland Guard made be made either by mail or conveniently via our donation page. We are also looking for firefighters willing to make the commitment to join the Highland Guard. Thanks for visiting our website to learn more about our organization.